There seems to be a very distinct difference between DreamWorks and Pixar developing lately. DreamWorks animation seems to be a studio disinterested in taking risks. It's films are silly and they don't care if you know it. They are all fluff, all designed to sell toys, clothes and lunch boxes. These are movies that are completely harmless, and I think they cater to one specific age group. I feel Pixar draws its audiences in with its emotional beats. There are moments in several Pixar films and themes in several Pixar films which I never thought I'd see in animated films. Pixar is a wildly ambitious studio, constantly taking chances, and they seem to payoff every time. Well, except before the studio went into sequel mode. I don't want this to sound like a diss toward DreamWorks, because I have liked several of their movies. It's hard for me to argue against the likes of "Kung Fu Panda," "How to Train Your Dragon," "Megamind" and especially the first two "Shrek" movies. I even liked the first "Madagascar" movie quite a bit, and I think out of all of their films, "Shrek" and "Madagascar" came the closest to matching the Pixar anesthetic. Silly can be entertaining too, I will warn however, that silly is much harder to pull off. "Penguins of Madagascar" is silly from the very beginning. I will give the movie credit for being a movie that is not afraid of its themes. It's not trying to be emotional, it's not trying to be ambitious, it's only trying to make you feel good with its lunacy. There are moments in which I feel it succeeds at its goals. 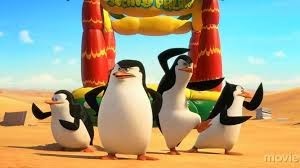 Overall, "Penguins of Madagascar" is pure fluff, nothing I think parents will have a good time sitting through. This is the type of "family movie" where parents should just drop off their children, if that were even allowed. As the film opens we meet Skipper (Tom McGrath), Rico (John DiMaggio) and Kowalski (Chris Miller) as baby penguins. We also witness their preposterous recovery of an egg that hatches to become Private (Christopher Knights). While this could have been a very touching scene, it ends up only to serve an unfunny punch line. In fact, there are several moments throughout the film which try to hit high emotional beats. But every time, for some reason, the film pulls back. This film seems to be afraid to get any sort of reaction from the audience. All this movie wants to be silly, and it plays the silly card each time. It seems like if the movie tries to be anything else, the world will rail against it. Honestly, I am a little scared to go on with describing the movie. Because I feel the story gets so off-the-rails that it just comes off as odd. The films story could have fit better into an "Incredibles" sequel instead of a "Penguins" spin-off. All throughout the "Madagascar" films, we have been familiar with talking animals. Talking animals is one thing, animals wearing jetpacks, turning into humans, and using rays in order to create monsters is something else. Yes, it is a very odd story, even for a children's movie. The movie feels so radically different compared to the rest of the franchise in which it is connected to that it feels like a different franchise all together. I love that John Malkovich turns up as Dave, an octopus out to get revenge against the Penguins. I also love that Benedict Cumberbatch provides the voice for Classified, a wolf who is also a secret agent out to protect outdoor animals. I'm sure children will completely embrace the silliness of this movie, but parents, you'll remain incredibly bored and might be shocked by just how weird this movie really is. I know what your thinking, "it's just a kids movie." I get it. That is the exact same thing my dad said as I tried to explain this to him. But when you've watched an entire franchise of movies about talking animals, and those animals can only talk, not create machinery, or become secret agents, that means something. "Penguins of Madagascar" takes its characters and their world in a completely different direction, and it just rang strange, and most of all, it rang false. Add that to a story that pulls the reins on any emotional beats, and you've got a weird mess of a movie. But hey, its DreamWorks. I don't think they had quality in mind, just quantity of profits.